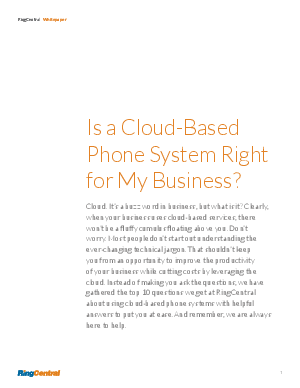 > Research Library > RingCentral > Is a Cloud-Based Phone System Right for my Business? A phone system that can integrate your desk phones, smartphones, and tablets is possible because of cloud technologies. And you are empowered to manage your entire company communications with a web browser and mobile app. RingCentral’s service frees businesses from outdated modalities of work and obsolete hardware—giving you voice, fax and text capabilities you can manage and access anywhere you go.